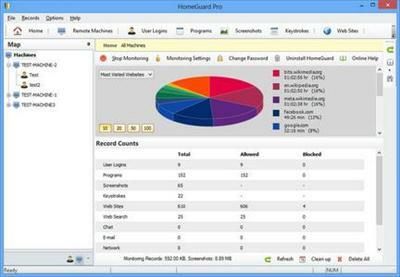 HomeGuard Professional is an easy to use activity monitoring tool for tracking and controlling the use of computers in home and office networks. HomeGuard records web activity and automatically blocks all adult and inappropriate content in websites in addition to customizable website block and allow lists and filtering based on file types (e.g. : exe downloads or online flash games). Quảng cáo: Bạn không được xem đường dẩn này, xin vui lòng đăng ký hoặc đăng nhập để xem.